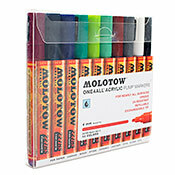 Molotow's 227 set includes 10 x ONE4ALL 227HS. 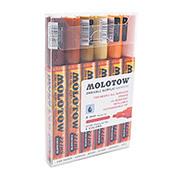 Each marker is equipped with the exchangeable 4mm Round-Tip showcasing secondary color ranges. The set is packaged in a clear box with product information on the front and backside. This product was added to our catalog on Friday June 27, 2014.